Linear drive technology in all axes. 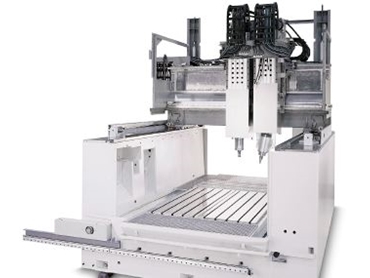 WITH two spindles and high dynamic linear drives in all axes, the DMC 165 V linear, available from DMG Australia , offers optimal conditions for both 5-axis HSC milling and roughing down. That's the trouble with milling. Users, and in particular those from the fields of tool and mould making, want all the possibilities offered by modern HSC technologies at any cost, and are just as demanding when it comes to roughing from blocks. Up to now, the only solution in the field of vertical centres has been to compromise cutting data in favour of complete machining or invest in two optimally collimated manufacturing units. Because a solution to both problems was nowhere in sight - especially for 5-sided or 5-axis simultaneous machining. The answer to this problem in modern manufacturing technology was given at EMO 2001 in the form of the new vertical machining centre DMC 165 V linear from Deckel Maho Geretsried. This new development opens up a new dimension in highly dynamic cutting, thanks not alone to the gantry machine with linear drives in all axes. The DMC 165 V linear also for the first time offers the option of using different spindles separately in one and the same machine as quasi independent production units so that it can be run with the best cutting data for every cutting task. "This gives customers the opportunity to uncompromisingly meet all requirements of modern cutting technology for relatively little extra cost - even in the field of dry machining and hard milling", explains Matthias Gronies, managing director of Deckel Maho Geretsried. The standard model has a vertical motor spindle with 33kW which provides up to 191Nm torque (with a 20 per cent duty cycle) at a maximum speed of 12,000rpm. Combined with impressive feed forces of up to 20kN, this leads to high cutting performances and very good results in terms of surface quality. Alternatively, a higher-speed roughing spindle with 20,000 rpm is also available. Both spindles have already proven their worth in horizontal machining centres in series production. Each of these two spindle variants can be supplemented with a newly developed 2-axis rotary/pivot head with a 30,000 HSC spindle. This allows the cavity to be pre-roughed and then the contour simultaneously finished using 5 axes in only one clamping. Both the axis of rotation (continuous) and the automatically movable swivel axis (up to ±95°) of the head are fitted with direct drives and are thus just as dynamic and precise as their linear counterparts. A fourth alternative is based on the 'openness' of the gantry concept. Thus, two machines with different spindles can be 'switched in series' if necessary and the workpieces 'channelled' through the working space from one production unit to the next. The DMC 165 V linear accelerates with twice the acceleration due to gravity in all axes, in other words 20m/s2, up to an impressive rapid motion of 90m/min. Since all axes are arranged in the tool, the weight of the workpiece of course has no effect on the dynamics of the process and surface quality of the work-piece. The maximum workpiece weight is 8,000kg, with a clamping surface of 2,000mm x 1,500mm and a workpiece height of up to 1,080mm. Incidentally, the number 165 in its name, DMC 165 V linear comes from the X-travel of 1,650mm. The further travels are quoted at 1,200mm for the Y and 800mm for the Z-axis in the brochure.